"When BIGKEYS was first field-tested in Head Start classrooms, we received overwhelmingly positive feedback." "Children are attracted to the keyboard, not intimidated by it (as they sometimes are by a standard computer keyboard)." 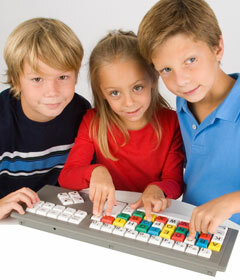 "When asked what they most liked about BIGKEYS, the kids said the colors made it fun. They also see it as not just a toy but as something they know grown-ups use." "A child's attention is held long-term, and they feel success in their ability to actually use a computer." "Staff felt that the fine motor skill development was enhanced with BIGKEYS." "It's fantastic, I love it!" "Now that's how a kid's keyboard ought to work." "BIGKEYS feels like the alphabet, not like a keyboard." "Kids don't get frustrated looking for letters; in alphabetical order typing is simpler." "When presented with an alphabetical layout kids are more successful." "The BigKeys colored keys give an added visual input AND you can pop off the keys to rearrange them into the QWERTY position! What a bonus!!" "BigKeys is a great piece of assistive technology!"